We’ve added a ’when to drink’ image to each back label and removed the QR code. If you’re wondering what a QR code is, that’s why we’ve ditched it. 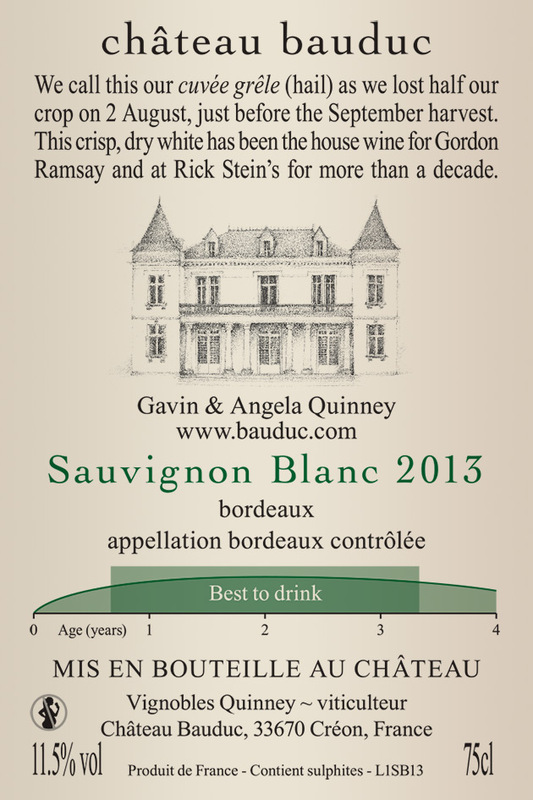 We have also taken on board what the lovely sommeliers at Rick Stein’s Seafood Restaurant observed when they changed ’Chateau Bauduc Bordeaux Blanc’ to ’Chateau Bauduc Sauvignon Blanc’ on the wine list. Roni and Jason suggested that they change the title of our wine on the list, and sales have gone up fourfold. We also asked our friend Laura Clay, who hosts many Bordeaux tastings in the UK, to briefly survey the audience at one event. 58 out of 60 people said that they would be more likely to buy a wine called Sauvignon Blanc than Bordeaux Blanc. Finally, having scanned the shelves of supermarkets in England at Christmas, there were an awful lot of cheap Bordeaux Blancs on offer. 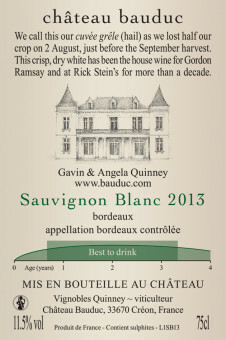 Of course, there are cheap Sauvignon Blancs too but it’s a popular grape; so we’ve decided to go with Chateau Bauduc Sauvignon Blanc. Our old-vine Sémillon label, Les Trois Hectares, hasn’t changed. As for boxes, we’re going with 6 bottle cases rather than 12s. 12 bottle cases will be available for mixed cases, for gifts and so on, but our standard cases will be 6s. Although they cost a bit more, the smaller boxes are much easier for our customers to carry. We’ve added a tick box to the side to show which label is inside – Gordon Ramsay, Rick Stein, Hotel du Vin or Other. This is so interesting, and shows you are serious about feedback and progress – very impressive on all counts!